My Own Modern Sampler: It may take a year! I’ve had some beautiful solids and black/white text prints in a box waiting for me to have time for them, and I’ve been studying all my favorite inspirations trying to decide how to use this stash. Then it came to me: I don’t have to choose! I’ve been wanting to make my own modern sampler quilt for some time, and this is it. I’m going to make lots of different blocks, JUST BECAUSE I WANT TO MAKE THEM and then combine them into this quilt. Here’s how it will go: I’ll make a block whenever it strikes my fancy and will post about it here in case you want to make it, too. Some will be original, some traditional or designed by other quilters. I’ll make a quilt when I have enough blocks, but I’m giving myself a year. Blocks will range in size from 3″ to 12″ and they won’t all be square! 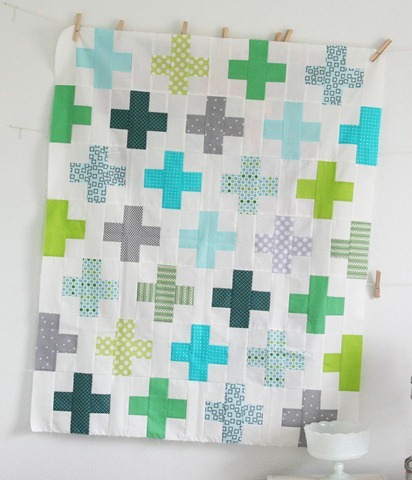 Obviously the 9-patch isn’t a new block, and there are “modern crosses” all over the web, like this one from Allison at CluckCluckSew, so my idea isn’t unusual. The point is, I enjoyed doing it! These blocks are just for fun. I figure these are too easy to require instructions, but I blogged about how to insert those narrow yellow bands, so check it out here if you want to know how I did it. And, since they are cut freehand and end up a little wonky, I started with 8 inch squares to get 6 inch finished-size blocks. I hope you’ll follow along with my sampler even if you don’t make the blocks. I’ve already made the next two (which are far fancier than these), and I’ll blog about them next week! 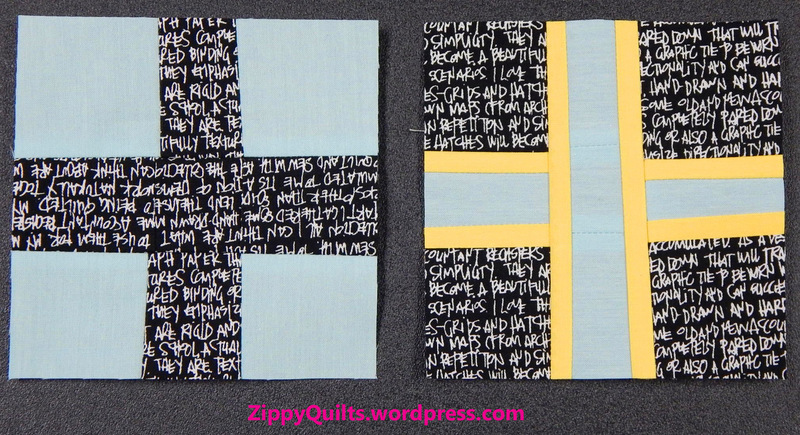 This entry was posted in Free Quilt Pattern, Improvisational quilting, Modern Quilts, Quilt Design, Quilting, Tutorial by zippyquilts. Bookmark the permalink. 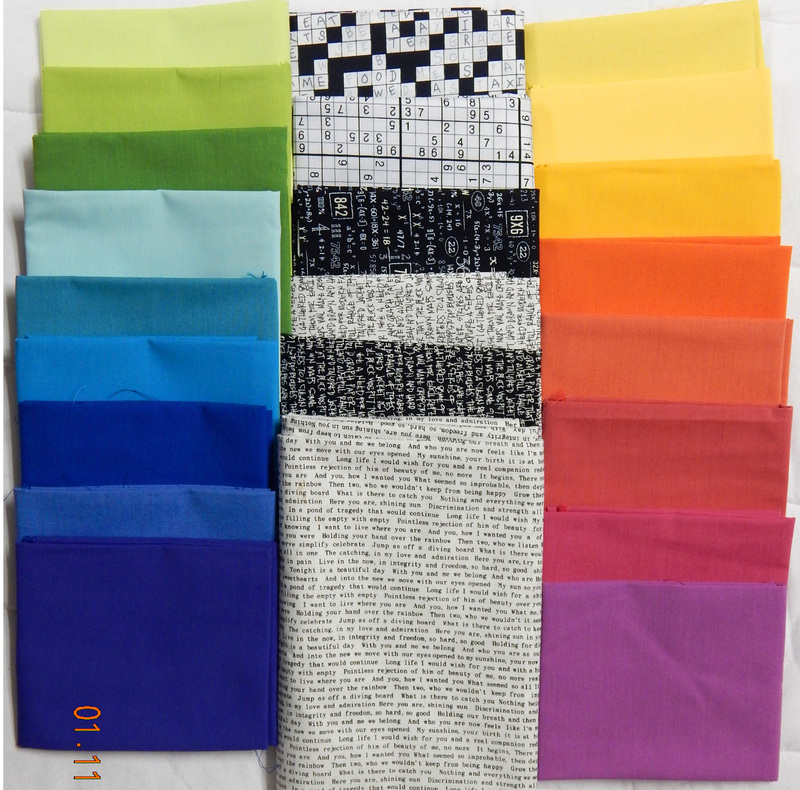 I LOVE those fabrics…ALL of them!! A few months back I was looking for a print similar to newspaper, something like your fabric at the bottom of the middle row…do you happen to remember where you got that? I’ll be watching to see how you use all these beautiful prints and colors! Sounds like a good solution to “what to do with these?” I like samplers because I get bored doing the same block over and over. Though I do doit sometimes. I also like your idea of varied sizes and shapes. Will be watching.